I have never been the biggest fan of pineapple on pizza, it just seems to make the pizza crust soggy with its juice. 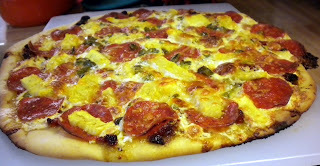 But I do love the flavor of pineapple with pepperoni so I thought what if I used fresh pineapple? Would that help with the sogginess, especially since I am using sourdough that I can crisp up on a pizza stone? It sure does! You get that sweet pineapple zing but without the undesirable soggy crust! Enjoy! What works best for me is I strongly throw the ball of dough down on a solid flat surface covered with a piece of wax paper until it is large and flat enough for me to easily balance on top of both of my fists. Then I make an X with my arms keeping my fists close together (backhand to backhand, the dough atop of them both) and I fling the dough upwards with my fingers as I simultaneously bring my arms quickly parallel (palm to palm) about 3-4 inches apart. As the dough falls I remake my fists and catch the dough atop them again in the X position and repeat until the dough has formed a 12-14 inch crust. Mix together all ingredients in a small bowl till mixed well and sit to side until ready to use. Sprinkle corn meal onto a baking sheet and lay skin on to it. Brush the sauce over the entire crust. Evenly sprinkle mozzarella over the sauce. Now evenly spread out pepperoni slices, pineapple and jalapeno over the mozzarella. Sprinkle cheddar evenly over pizza.